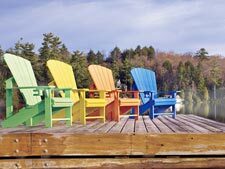 Our Adirondack Chairs Can Be Yours! 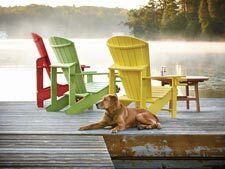 These are the ultimate maintenance-free Adirondack chairs in classic or the new upright style. Available in these 16 colors: Red, White, Blue, Yellow, Grey, Beige, Green, Black, Aqua, Kiwi, Sky Blue, Fuchsia, Orange, Cedar, Lime Green, and Chocolate. Length 35" x Width 32" x Height 40"
*Taxes, assembly and delivery may be applicable. Our logo at Cottage Connection has two Adirondack chairs side by side. The color of the chairs may have changed over the years, but they still signal "vacation time" to us. If you could use only one picture to be the embodiment of vacation, it would have water, trees, sunshine, and Adirondacks. properties. It is important to us that these chairs be of high quality at a good value with low maintenance. It took us a really long time to find what we wanted. For the past ten years, we have been proud to offer these amazing chairs! Our pricing is always below retail and we can drop-ship these chairs anywhere in the United States, right to your door. Take a look, give us a call and ask us questions. These are the best Adirondack chairs at the best price. To sweeten the deal, they are made from recycled plastic right here in North America! We found a manufacturer who believes the same things we believe who started manufacturing recycled plastic furniture in an effort to divert used plastic away from landfills and limit unnecessary felling of trees. Their goal is to make products that provide the look and warmth of wood, without the typical shortcomings associated with maintaining wood furniture. The proprietary extrusion process discovered, improved and customized by this company, produces a unique plastic lumber that doesn't mold, rot, splinter or crack. This process creates a superior fit and finish, including a beautiful textured-look similar to the grain of the wood. The furniture also has smooth rounded edges for enhanced comfort. With an added automotive-grade UV stabilizer, each piece is guaranteed to maintain its beautiful bright color for years, without the need for any staining or painting. 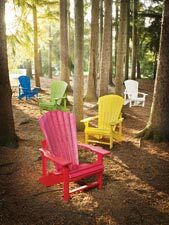 Since perfecting the durability and comfort of their flagship Adirondack chair, they have added a line of lounge chairs and benches, dining and casual tables as well as a variety of accessories to complement their collections. In their pursuit of groundbreaking innovation and design, they continue to advance their extrusion process even further.